Dr. 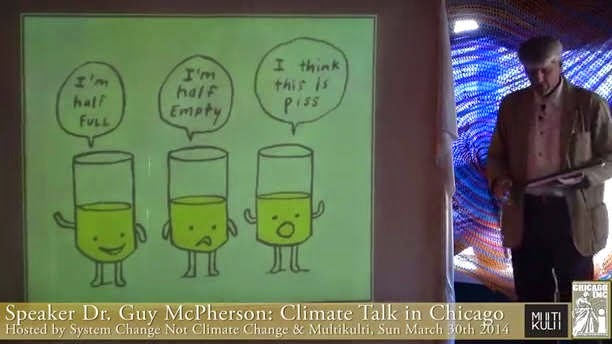 Guy McPherson spoke on climate change to a Chicago audience in March, from the basics to the complexities of our current predicament. He looks at the history of mainstream, conservative projections of global temperature change, the pattern of increasingly worse expectations every year, and the dozens of positive feedback loops not even taken into account in the models generating these predictions. The scientific consensus is that we must limit global temperature rise to 1°C above the predindustrial baseline to avoid triggering those feedback loops and thus catastrophic runaway climate chaos. We're at .85°C right now and have already triggered many of these loops. This .85°C increase is the result of emissions up to 40 years ago; due to the lag time between release of carbon dioxide and its effect on temperature, we're not yet experiencing the exponentially increasing emissions of the 1980s and 1990s, or of this century. The political target of 2°C maximum increase doubles the maximum change considered "safe" by scientists and is not being taken seriously by politicians anyway. A study of the cooling effect of the atmospheric sulphates continually produced by industrial activity suggests that if all activity stopped today, within three days when all the sulphates have dropped out of the atmosphere, we would reach a 2°C increase. So although shutting down the industrial economy immediately is our only hope of minimizing catastrophic change, doing so would already leave us at a dangerous level of change. In short, we're in huge trouble. Though McPherson thinks we're already triggered too many feedback loops to avoid massive die-off of all humans and most other species, he still advocates resisting industrial civilization, fighting back, and doing our best to stop it. He points out, for example, the potential of sabotaging electrical transformers to terminate the US electrical grid. Though we know the situation is dire and that this massive die-off is in fact inevitable if civilization is allowed to carry out its endgame, we can't fully predict the restorative potential of the earth. Life wants to live, and science does not and can not understand and foresee how the earth may recover if we can take off the pressure of further destruction and greenhouse gas release. Watch this video, seriously contemplate our predicament, and consider how you can respond with effectiveness proportionate to the reality we face. McPherson quotes Edward Abbey: "Action is the antidote to despair," and urges us to act. The Deep Green Resistance strategy of Decisive Ecological Warfare, and the entire Deep Green Resistance book are excellent starting points for formulating a plan. There are many introductions by attendees; Guy's presentation starts at 17:20.